Alexander Pope (1688–1744). An Essay on Man. 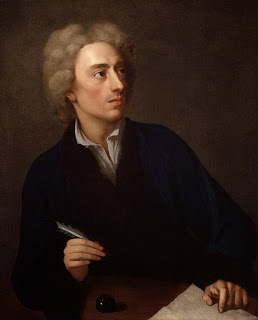 The sharp tongue of Alexander Pope made him celebrated, yet widely feared. In a representative product of his versatile pen, he gracefully combines his flashing wit with sage advice. OH Happiness! our being’s end and aim! O’er-look’d, seen double, by the fool, and wise. Say, in what mortal soil thou deign’st to grow? Or deep with di’monds in the flaming mine? Or reap’d in iron harvests of the field? And fled from monarchs, St. John! dwells with thee. To trust in ev’ry thing, or doubt of all. Than this, that happiness is happiness? Equal is common sense, and common ease. Subsist not in the good of one, but all. Shall find the pleasure pays not half the pain. That such are happier, shocks all common sense. All nature’s diff’rence keeps all nature’s peace. One common blessing, as one common soul. And each were equal, must not all contest? God in externals could not place content. But future views of better, or of worse. By mountains pil’d on mountains, to the skies? And peace, oh virtue! peace is all thy own. But these less taste them, as they worse obtain. Who risk the most, that take wrong means, or right? Which meets contempt, or which compassion first? One they must want, which is, to pass for good. Who fancy bliss to vice, to virtue woe! Best knows the blessing, and will most be blest. For ills or accidents that chance to all. See Falkland dies, the virtuous and the just! See god-like Turenne prostrate on the dust! See Sidney bleeds amid the martial strife! Was this their virtue, or contempt of life? Lamented Digby! sunk thee to the grave? Why, full of days and honour, lives the sire? When nature sicken’d and each gale was death! Lent heav’n a parent to the poor and me? What makes all physical or moral ill? There deviates nature, and here wanders will. Short, and but rare, ’till man improv’d it all. When his lewd father gave the dire disease. Prone for his fav’rites to reverse his laws? Forget to thunder, and recall her fires? Oh blameless Bethel! to relieve thy breast? Shall gravitation cease, if you go by? For Chartres’ head reserve the hanging wall? Contents us not. A better shall we have? But first consider how those just agree. But who, but God, can tell us who they are? This cries there is, and that, there is no God. Nor with one system can they all be blest. And what rewards your virtue, punish mine. Or he whose virtue sigh’d to lose a day? What then? is the reward of virtue bread? Where folly fights for kings, or dives for gain. Nor is his claim to plenty, but content. But grant him riches, your demand is o’er? ‘Why bounded pow’r? why private? why no king? Nay, why external for internal giv’n? Say, at what part of nature will they stand? Is virtue’s prize: a better would you fix? Or public spirit its great cure, a crown. With the same trash mad mortals wish for here? Yet sigh’st thou now for apples and for cakes? As toys and empires, for a god-like mind. The virtues of a saint at twenty-one! Content, or pleasure, but the good and just? Esteem and love were never to be sold. Because he wants a thousand pounds a year. Act well your part, there all the honour lies. The frier hooded, and the monarch crown’d. I’ll tell you, friend! a wise man and a fool. The rest is all but leather or prunella. That thou may’st be by kings, or whores of kings. Count me those only who were good and great. Nor own your fathers have been fools so long. What can ennoble sots, or slaves, or cowards? Look next on greatness; say where greatness lies. Or make, an enemy of all mankind! Yet ne’er looks forward farther than his nose. Not that themselves are wise, but others weak. Is but the more a fool, the more a knave. Like Socrates, that man is great indeed. A thing beyond us, ev’n before our death. The same (my lord) if Tully’s, or your own. Or on the Rubicon, or on the Rhine. An honest man’s the noblest work of God. Is hung on high, to poison half mankind. Than Cæsar with a senate at his heels. In parts superior what advantage lies? Tell (for you can) what is it to be wise? Truths would you teach, or save a sinking land? All fear, none aid you, and few understand. Above life’s weakness, and its comforts too. Say, would’st thou be the man to whom they fall? Mark how they grace Lord Umbra, or Sir Billy. Look but on Gripus, or on Gripus’ wife. See Cromwell, damn’d to everlasting fame! From ancient story learn to scorn them all. See the false scale of happiness complete! How happy those to ruin, these betray. Or infamous for plunder’d provinces. E’er taught to shine, or sanctify’d from shame! What greater bliss attends their close of life? And haunt their slumbers in the pompous shade. A tale, that blends their glory with their shame! Since but to wish more virtue, is to gain. See the sole bliss heav’n could on all bestow! All end, in love of God, and love of man. It pours the bliss that fills up all the mind. And strongest motive to assist the rest. Gives thee to make thy neighbour’s blessing thine. Is this too little for the boundless heart? And height of bliss but height of charity. Must rise from individual to the whole. And heav’n beholds its image in his breast. Oh master of the poet, and the song! Intent to reason, or polite to please. Pursue the triumph, and partake the gale? Thou wert my guide, philosopher, and friend? And all our knowledge is, ourselves to know. Would You Converse with Royalty? What Does Your Dog Think of You? What Would You Ask Judas Iscariot?